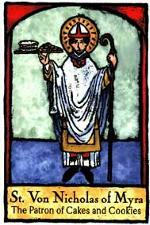 Until I visited Santa Fe I had no idea that there was a patron saint of cakes and cookies. But sure enough, there he was in a little shop that sold a really astounding variety of saintly goods – Saint Von Nicholas of Myra. Often when someone travels from our office they bring back candies or treats from the place they visited—salt water taffy from the beach, chocolates from Vienna. In keeping with that same spirit, I picked up one to the little St. Von Nick icons as an office gift. Since he was the patron of cakes and cookies, I decided we could hang him up in the area where we always share treats at work and maybe he’d have a beneficial effect on our supply of baked goods. When I arrived at work the next morning at 8:30, a colleague said, “Vicki! Did you see? The saint worked!” A pan of brownies graced the treats counter beneath the icon. They were brought in by a co-worker who had not been in the office on Monday, and therefore had not yet read the e-mail. Truly a miracle. I am looking at a counter filled with love right this minute. I have zucchini bread, and low-carb peanut butter cookies, and leftovers from a delicious Thai lunch. Not to mention bouquets of flowers, which feed the soul and are themselves perishable. All of this to help me heal from a small surgery. It’s working like a charm, too. I wonder if we shouldn’t have special healers with the power to write prescriptions for brownies, fruit pies, breads, and cookies, casseroles and soups and salads. I think there could be a great deal of value in that. And no risk of dangerous side effects, even in the event of an overdose. On the day that St. Von Nicholas set up residence in our office, a gentleman, B., came to my doorway and explained that while he liked brownies just like everyone else, he was really a pound cake man. So later that week I took a pound cake, sliced, individually wrapped, and packed in a basket. I set the basket beneath the icon at 8:30, and at 9:30 B. brought the empty basket to my office. “We need more,” he said. I shook my head. “I hope you got more than one piece,” I told him, since he really was the only reason I had made pound cake in the first place. His big blue eyes got rounder—and yet they conveyed a terrible sadness. Then he held up four fingers. The Japanese iris are about to open. I hope. Behind and on the right in the raised bed are onions and potatoes, and in the center background are the white peonies, which can no longer hold their heads up, and behind them tall, wispy asparagus plants. We’re letting them grow for another year before beginning to harvest the young shoots. I had to hold the stem of this peony while I took the picture. Beyond the rosemary and cilantro, Ernesto checks his baby lettuces. Gardens give their owners so much joy and discontent that sometimes they seem to be a metaphor for life. There is more to them than meets the eye; all sorts of memories and emotions cling to them. 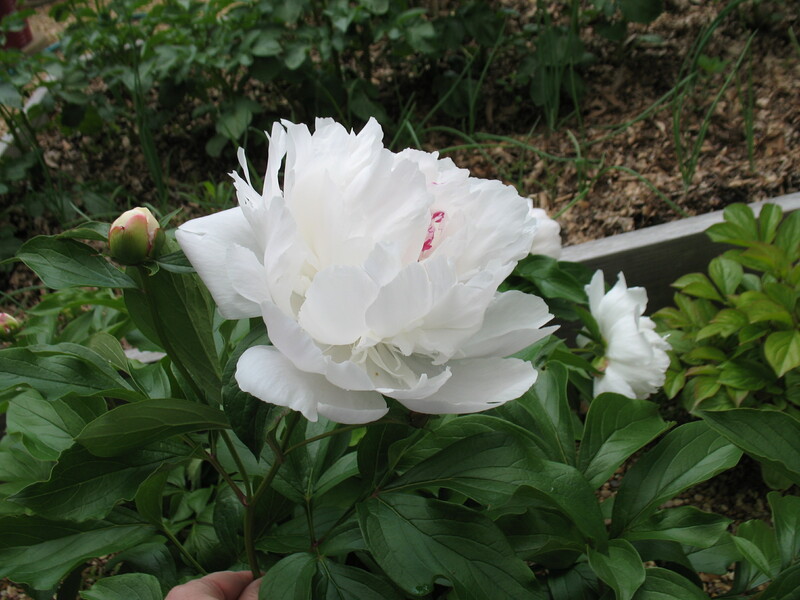 … [T]he delicate, finely-cut ferns of asparagus bring to mind the memory of a beloved grandfather; the sumptuous globe of a peony, bending under its own weight, serves as a reminder of a child’s wonder at what seemed to be drops of blood on the white petals. 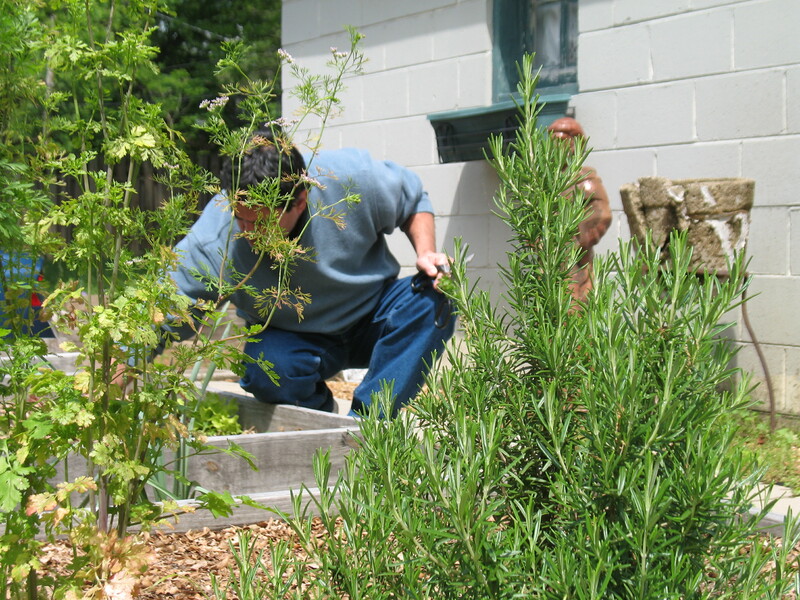 I think of this complex of conscious and unconscious associations as an “invisible garden” that each of us, gardeners and garden visitors alike, carries around. These associations remain dormant until the plants we happen to be looking at reawaken them. Then old, half-forgotten feelings wash over us, perhaps joy and pleaure, perhpas loss and pain. We can never know in advance how walking through a garden wlll make us feel. Sometimes the fresh perceptions of childhood come back to us for a few glorious moments. Sometimes, seemingly for no reason at all, we become sad. 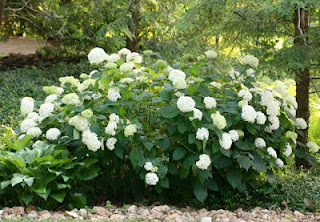 Always it is the invisible garden that gives the visible garden its deepest meaning. 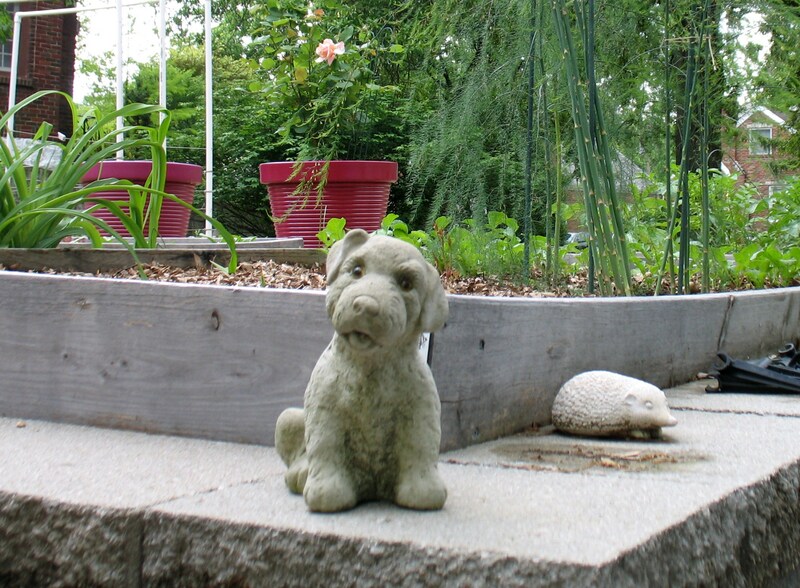 One of my garden ornaments, Stone Puppy, was a high school graduation present. Originally I used him as a doorstop in my bedroom. One day Mama figured out that if she asked our rat terrier, Lucy, where Stone Puppy was, Lucy would flip out–she would run to the bedroom and begin to sort of dig frantically at his stony front feet. We could ratchet up the frenzy by picking up Stone Puppy and pretending to caress him, as if he were a real puppy. Lucy didn’t care for that one bit. Seeing Stone Puppy in the garden makes me happy. 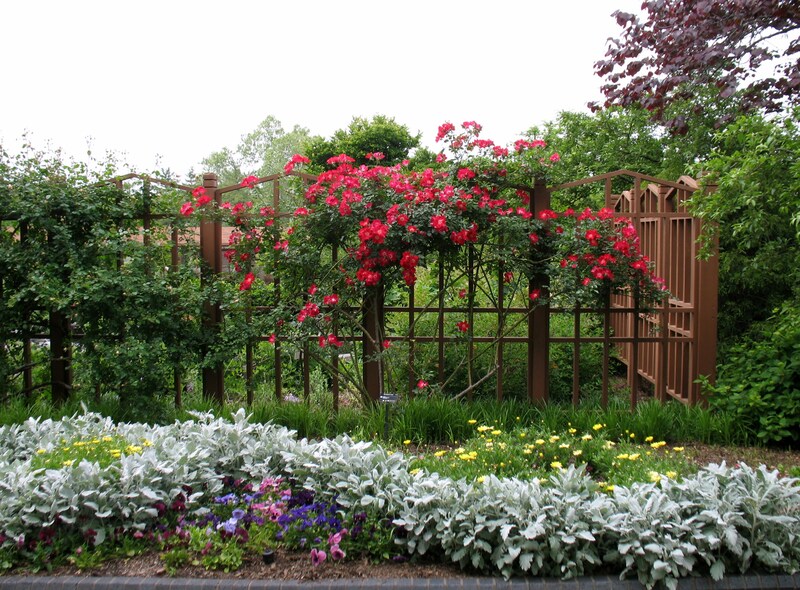 The North Carolina Arboretum has a quilt garden, which changes seasonally. I would like to try something similar on a small scale. We recently planted some strawberry begonia and forget-me-nots that could possibly work in a flower quilt. We put them on the bank between the house and the driveway–a bank that’s difficult to mow and needs a nice groundcover instead. I tried to get some creeping phlox started on it last spring, but it failed to take. And I watered it so faithfully until I forgot! I think there’s a tiny puff of phlox still holding on to the bank, but it couldn’t muster up enough energy to bloom so I’m not certain. I don’t know how my flower quilt project will go. I’ve never been good at gardening or sewing, although I did sort of make a blanket once. I’d been craving an expensive raspberry-colored silk coverlet from the Garnet Hill catalog. Then, while watching PBS one Saturday morning, I saw a crafty woman make a throw out of polar fleece cut with pinking shears. I ran to Joanne’s Fabrics which, in a clear demonstration of the rightness of this project, happened to have polar fleece on sale for $3.99/yard. I bought three yards of deep raspberry-red fleece and a pair of pinking shears. Fifteen minutes later (I’m awkward with fabric and shears) I folded my new throw and placed it at the foot of the bed, where it glowed against the white coverlet on my down comforter. I celebrated my wonderfully successful project by buying a bunch of deep pink flowers (Gerbera daisies and carnations) mixed with white stock, and placed them in a silver base on the bedside table. It still makes me happy to think of it.